Have you ever wondered what would happen if Scrabble and Sodoku got together and had a baby? Well, wonder no more, because Numbler is that theoretical offspring. Part crossword, part math quiz, this app takes the best of both and shapes it into a number-crunching good time. If the math muscles in your brain need a work out, then pick up your iPad and start playing Numbler. Basic math skills – addition, subtraction, division – are necessary in order to play this game. 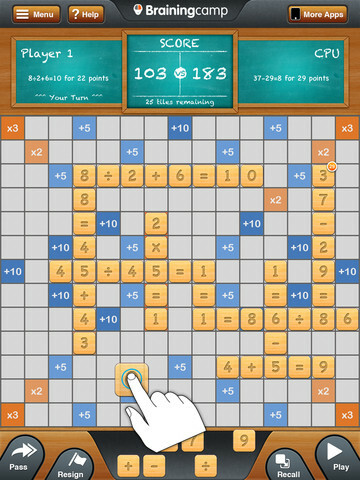 The board itself is quite similar to the layout of Scrabble or Words With Friends, but instead of letters the game tiles consist of digits and equation markers. During every hand you have to use at least two tiles from your stash and one that has already been placed on the board. You can play against the computer pr take turns with another player sitting next to you. Obviously my two kiddos are too young to play this game so I can tell you first hand that Numbler is no math joke. While there is no time limit a few rounds took me at least a half-hour. Game play isn’t complicated at all – just making an equation sounds much easier than it actually is, especially if you play against the computer like I did. Just a small hint: You can place two numbers next to each other to create the sum of the two – a 1 next to a 3 will play out as 4 and not 13. After playing Numbler I was reminded of how much I needed to work on my math muscles; this game is just as challenging for adults who haven’t had a math lesson in years, as it is for kids who are currently in school. Older school-aged kids will really enjoy this fun and challenging math game. It would make a great addition (pun intended) to the education app lineup in your iPad and a great math app for homeschoolers. It would eliminate the need for paper math worksheets and pre-formulated math equations; it offers a level of math creativity that I haven’t seen in other math apps that we’ve tried. The app is a free download so it’s worthwhile to check it out, especially if your math muscles are screaming for some strength training. 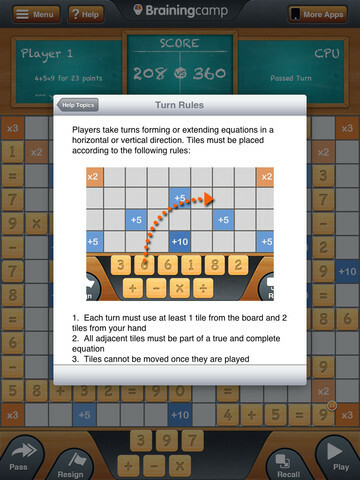 This app is a new and exciting way to fine-tune math learning in a familiar board game layout.